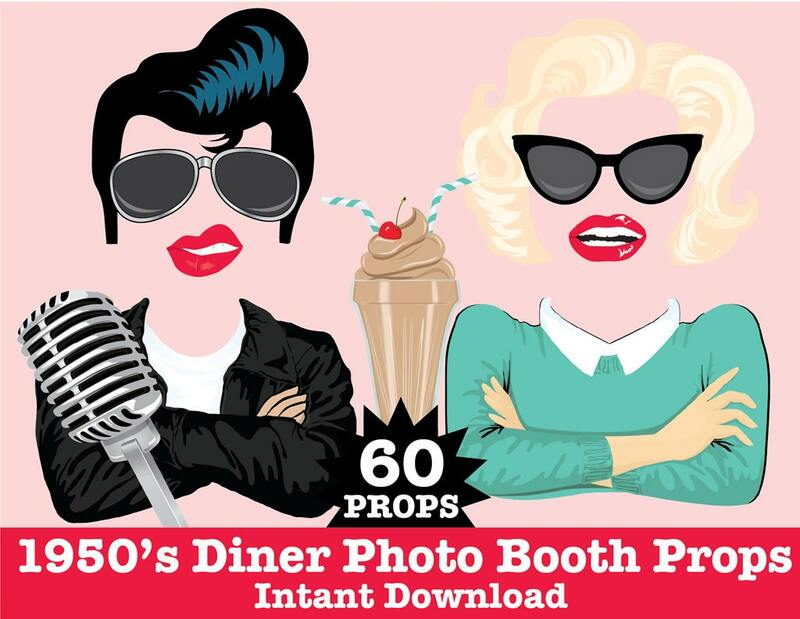 (¸.·´This 50's Diner Photo Booth Prop DIY Printable kit includes 60 props: Elvis Hair ★ Elvis Lips ★ ★ Marilyn Hair ★ Marilyn Lips ★ Leather Jacket ★ Girl in Sweater ★ Hair in Curlers ★ Ponytail Hair ★ Boy Hair ★ Waitress Hair/Hat ★ Diner Hat ★ Girl Scarf Hair ★ Baseball Hat ★ Jukebox ★ Diner Sign ★ Pay Phone ★ Phone Receiver ★ Turquoise Scarf ★ Red Scarf ★ Bow Tie ★ Neck Tie ★ Fedora Hat ★ Mic★ Root Beer Float ★ Platter of Fast Food ★ Sugar, Napkin, Salt & Pepper - Table Setting ★ Coffee Pot ★ Coffee Cup ★ Stack of Pancakes on a Plate ★ Bacon, Eggs & Toast on a Plate ★ Donuts (2) ★ Chocolate Shake ★ Soda Pop Bottles with Straws (3) ★ Record ★ Hot Dog ★ Ice Cream Sundae ★ Cola in a Glass with a Straw ★ Comb ★ Lipstick ★ Lips (3) ★ Mouth Blowing Bubble ★ Mustaches (5) ★ Sunglasses (5) ★ Eye Glasses (3) ★ Grab a prop sign ★ Instructions, plus information pdf for materials needed & paper suggestions. 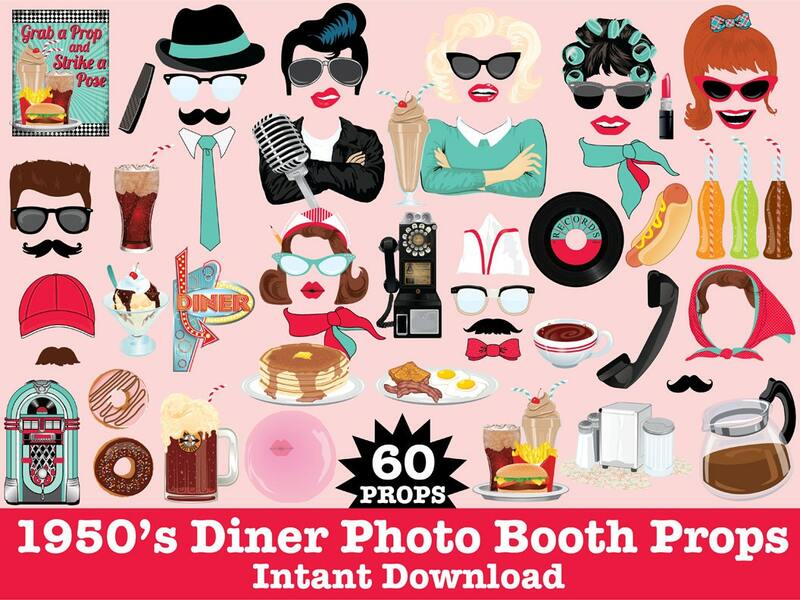 Your party will be rock'n with this enormous Diner collection!! 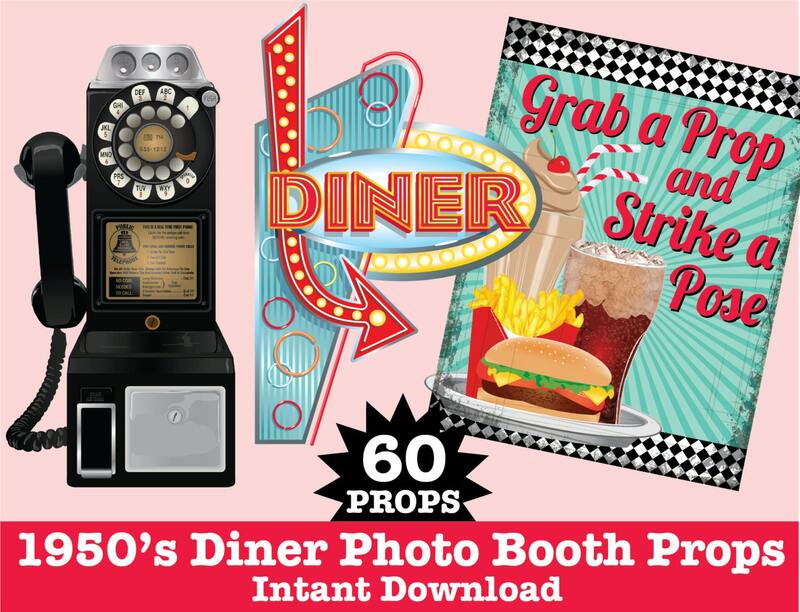 They're great for party decor... table centerpieces... party favors... or even a hostess gift! 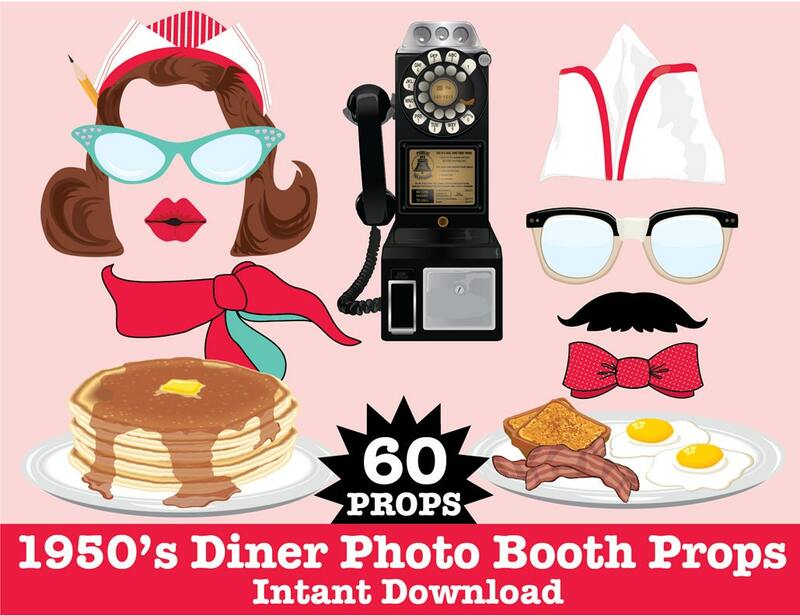 There will be tons of smiles... laughter galore... and rock'n memories to share with this 50's Diner Kit. I had no issues opening the files. I sent the file to Staples for printing. It came out great! Tried to download on 3 different computer's (followed all directions) and no luck! Needless to say I paid for props and got nothing!